When two things work together to create something that is better than the two standing alone, that is called “synergy.” When two garden plants work together, that is called “delightful.” A perfect example is the combination planting in the Mary Snoddy garden of Arum italicum and Hosta. Every good gardener knows or grows hosta. These shade-loving perennials vary in size from tiny (‘Blue Mouse Ears’ is four inches tall) to giant (‘Empress Wu’ can reach forty inches in height and almost six feet in width). Leaf colors range from blue-green to chartreuse, with every green shade between. Accents can be white or cream, or include reddish leaf stems. Leaf shapes can be rounded, pointed, cupped, twisted. Fragrant blooms can be white or shade toward lavender. With 70 species and almost 3,000 registered varieties, gardeners can find one to fit their taste and size requirements. I suggest that you consult a reference book for size and preferred growing conditions. My favorite is The New Encyclopedia of Hostas, by Diana Grenfell and Michael Shadrack, published by Timber Press in 2009. Hostas are one of the few plants that will do well in dryish shade. The only downside is their susceptibility to damage from deer and slugs. Hostas pop through the ground in spring, are gorgeous through warm seasons, but then wither and disappear with the onset of color weather. This is when Arum struts its stuff. 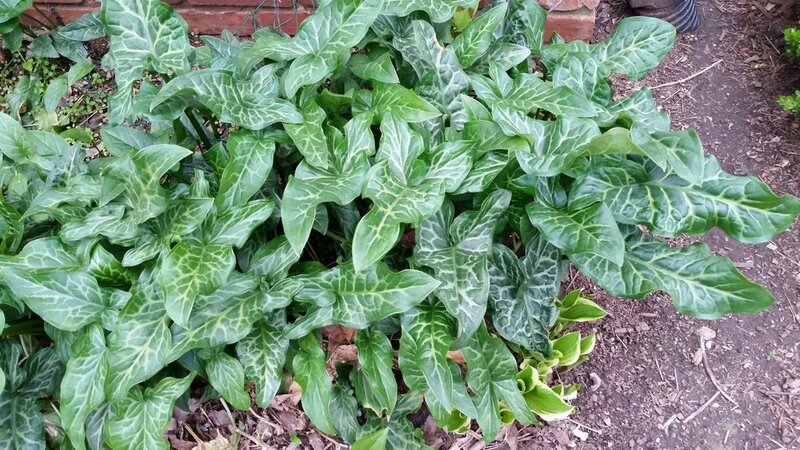 Italian Arum, sometimes called “Lords and Ladies,” is dormant through the hosta growing season. It pokes triangular heads through the soil about the same time that hostas are going nighty-night. Those heads unfurl to glossy, arrow-shaped leaves that are marked with white veining. They reach 6 to 12 inches in height. The leaves remain gorgeous throughout our cold season. They grow in zones 6 to 9. Like hostas, they are prone to slug damage. Unimpressive, tiny white arum blooms are followed by spikes of gorgeous, bright orange berries that persist after the leaves die down, at the onset of warmer temperatures. Plants will slowly multiply themselves via fallen berries or you can help them along by harvesting and spreading the seeds. You can also divide the clumps when they are dormant (summer). Arum berry spikes are bigger with a little bit of sunshine, but leaves are larger in more shade. A common slug/snail treatment is metaldehyde. It is toxic to cats and dogs, so here at New Hope Farm I opt for a non-toxic treatment based on iron phosphate that is safe for pets and people. (Sluggo is my brand of choice. There are others.) If you have a large snail population, you will probably want to reapply every two-three weeks, depending upon rainfall and irrigation. Arum and hosta are a perfect pairing underneath deciduous trees. This photo of Arum was taken in early March, last year. Note the emerging hosta leaves at lower right. Immature Arum seeds. These turn bright orange when mature. Sample of hostas, showing different leaf colors.